Magnetohydrodynamic Generation – In thermal generation of electric energy, the heat released by the fuel is converted to rotational mechanical energy by means of a thermocycle. The Modern Power System Analysis mechanical energy is then used to rotate the electric generator. Thus two stages of energy conversion are involved in which the heat to mechanical energy conversion has inherently low efficiency. Also, the rotating machine has its associated losses and maintenance problems. In MHD technology, electric energy is directly generated by the hot gases produced by the combustion of fuel without the need for mechanical moving parts. In a Magnetohydrodynamic Generation generator, electrically conducting gas at a very high temperature is passed in a strong magnetic field, thereby generating electricity. High temperature is needed to ionize the gas, so that it has good electrical conductivity. The conducting gas is obtained by burning a fuel and injecting a seeding materials such as potassium carbonate in the products of combustion. 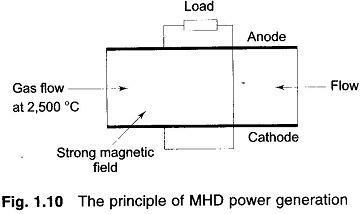 The principle of MHD power generation is illustrated in Fig. 1.10. About 50% efficiency can be achieved if the MHD generator is operated in tandem with a conventional steam plant. Though the technological feasibility of MHD generation has been established, its economic feasibility is yet to be demonstrated. India had started a research and development project in collaboration with the former USSR to install a pilot MHD plant based on coal and generating 2 MW power. In Russia, a 25 MW MHD plant which uses natural gas as fuel had been in operation for some years. In fact with the development of CCGT (combined cycle gas turbine) plant, MHD development has been put on the shelf. In a geothermal power plant, heat deep inside the earth act as a source of power. There has been some use of geothermal energy in the form of steam coming from underground in the USA, Italy, New Zealand, Mexico, Japan, Philippines and some other countries. In India, feasibility studies of 1 MW station at Puggy valley in Ladakh is being carried out. Another geothermal field has been located at Chumantang. There are a number of hot springs in India, but the total exploitable energy potential seems to be very little. The present installed geothermal plant capacity in the world is about 500 MW and the total estimated capacity is immense provided heat generated in the volcanic regions can be utilized. Since the pressure and temperatures are low, the efficiency is even less than the conventional fossil fuelled plants, but the capital costs are less and the fuel is available free of cost.